DDoS attacks are easy to carry out and they can often garner widespread media attention, making them a popular tool for anyone wishing to interfere with an organization’s web-based and even e-mail services. Attackers often employ “botnets,” or networks of compromised computers to use as soldiers in a DDoS attack. Criminal software or “crimeware” has become increasingly available on cyber black markets that can enable a potential adversary to rent a botnet to execute a DDoS attack. Most recently the group Anonymous encourages it’s followers to use DDoS software that members can install on their own computers to participate in a DDoS attack, essentially voluntarily participating in cause to disrupt an organizations internet operations. The best defense for any attack or emergency is to have a plan and this also applies to cyber attacks. A basic understanding of DDoS attack concepts, a list of potential responses and a few key phone numbers will prepare the administrators of even the smallest networks to lessen the damage of a DDoS. 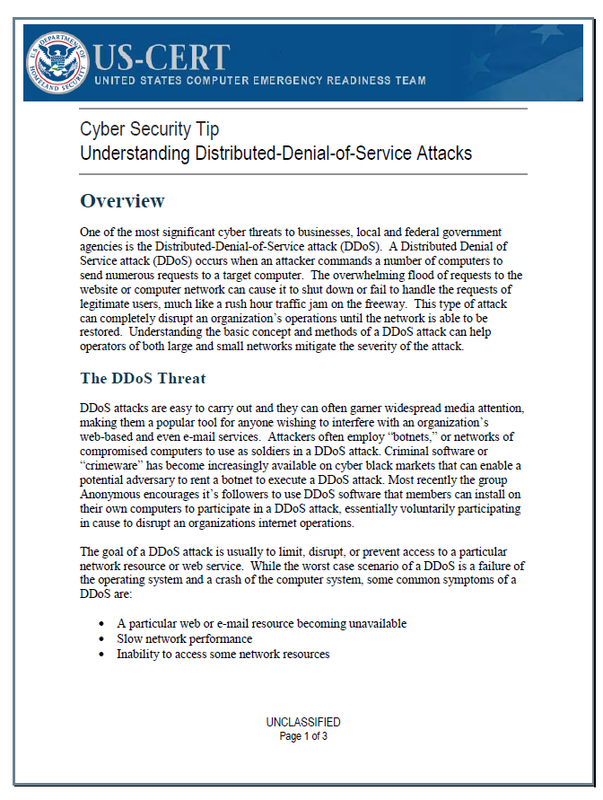 • Assess your organization’s risk for a DDoS. If your organization relies heavily on web-based services consider the potential impact to your operations if hit by a DDoS. • Develop a checklist of actions to take the event of a DDoS and have contact information for your Internet Service Provider ISP and your web hosting providers readily available. If you use a web host for your services, be familiar with their DDoS mitigation polices and plans. • Be familiar with the services your ISP might offer to mitigate a DDoS such as, temporarily increasing your bandwidth, switching your IP address, and blocking attacking IP addresses. • Understand your normal amounts of daily network traffic as well as the performance of your system. Many types of DDoS attacks may not actually bring the site down but can significantly reduce service. Properly configured performance monitoring can be a major help in detecting an attack early.